A His and Hers Closet with Storage and Style. An organized, beautiful wardrobe completes this dream master closet. Reimagining a sunroom into personalized and productive work spaces. Revealing a modern, beautifully-appointed closet design. A spacious closet with plenty of personal style. A tranquil home office with plenty of charm. Closet goals achieved: A large walk-in with ‘his’ and ‘hers’ space. A walk-in closet designed for both wardrobe and work space. Rethinking a traditional media center for a modern condo. Creating a glamorous, boutique-like experience for one Albany fashionista. Creating a cool, organized space with a place for everything. Creating the perfect pantry with smarter storage and a little creativity. Using a little creativity and savvy design skills, this North Carolina couple transformed their overstuffed master closet into a spacious oasis. Helping one family transform an old playroom into a modern homework zone for their two teenagers. 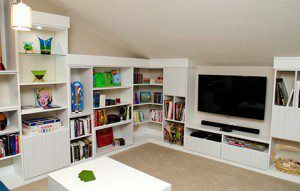 Professional yet inviting, this design provides space for the entire family and their favorite collectibles. Achieving a sleek space for the modern bachelor. Turning an unused upstairs space into an awe-inspiring dream closet. 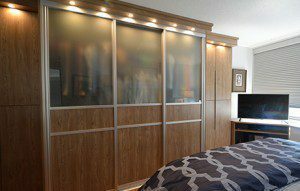 How smart lighting and streamlined organization transform a master closet. See how we embraced a room's dramatic ceiling height to create a grand, yet intimate library design. See how we designed a smart organizational system to accommodate multiple needs year round. Thoughtful design and plenty of storage give this client's bedroom a necessary finishing touch. Form and function combine in this modern high-rise penthouse with upscale details and thoughtful storage. Sleek and stylish features come together to transform an empty room into a multi-functional storage retreat. 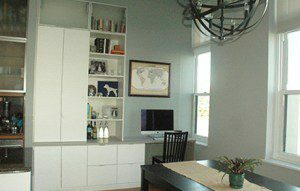 A utility room turns into an artistic, upscale space while providing the function and storage this couple needed. A masculine walk-in closet fit for a king blends both aesthetic and practical elements into a luxurious design. A challenging living space transforms into a functional, well-appointed room with plenty of storage and style. A custom craft space perfectly suits the client's creative needs and shows off her unique design aesthetic. High-end finishes and custom details transform an unused space into a sumptuous dressing room. 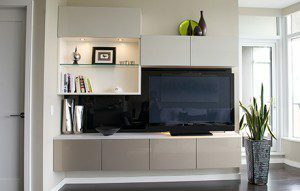 A living space gets a modern upgrade with a show-stopping entertainment center. 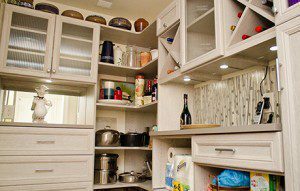 Stylish storage upgrades provide the updated design and added function this couple craved. A relaxing and sophisticated space replaces a spare room, providing a timeless, feminine sanctuary. For this couple, a standard walk-in closet becomes a sleek, contemporary space they can both enjoy.